From the If-you-can't-beat-'em,-join-'em department: to beat the summer heat and to head into a bit of adventure, I threw my running shoes into the corner last week and got on my bike for a week of riding through Denmark. 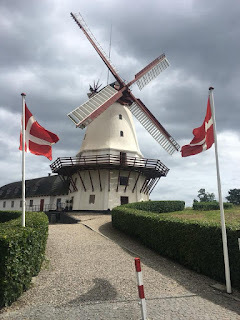 Denmark is perfect for biking: with an amazing network of bike trails, quaint countryside and towns, light hills, cool weather, and great food and beer. I worked out a route that looped through the part of the country that the Germans call the "Danish South Seas", a collection of laid-back islands full of fjords, old harbors and deserted beaches. To avoid packing camping equipment, I booked rooms along the way, at a couple of youth hostels, a B-and-B, a private tourist room, a hotel and an old inn. After cleaning, oiling and setting up my bike, filling the new panniers with some clothes, tools and overnight stuff, I was ready to go! My smartest investment was buying some padded biking shorts. And a bike-tour app really helped: Naviki. If you pay for the upgrade to calculate "leisure" routes, then it will find all the scenic routes off the main roads. From my home near Hamburg, Germany, I took the train north to Flensburg, the northernmost German town, which borders right on Denmark. I arrived late in the morning, so I had quite a bit of time to make my way along the short 47 kilometers to the first day's destination: the old Danish port of Sønderborg ("southern castle"). So I decided to take a lot of back ways and avoid the bigger roads when I could. Getting to the border was simple: just head north past the harbor and shipyard and follow the bike trails past Wassersleben, Flensburg's northern beach. Then I just crossed the bridge to the Danish side and followed the trail through the woods to Kollund Strand (beach). As soon as I hit the main road, Fjordvejen, I was on National Cycle Route 8, heading east. The road hugs close to the north shore of the Flensburg Fjord and its sparkling Baltic water. So now it was just a matter of following the bike route signs along the road towards Sønderborg. There was a dedicated paved bike trail next to the main road. At the town of Rinkenæs, the trail veered off the main road to go through a quiet neighborhood before reconnecting later. And after I got into Egernsund, I decided to abandon the roadside national bike trail, and to now head down the foot trail next to the Baltic shore. There is a long trail there, called the "Gendarmstien" (border police) trail. It follows the route that the Danish border patrol used for decades after this area was split off from the rest of Schleswig-Holstein, after World War I. The view is nicer here at the water, and there is no road noise. A few sections of the Gendarmstien trail have no-biking signs, but then I just pushed the bike when walkers approached. The trail took me past a marina, through fields, then into the back streets of Broager, the next town, with its impressive white church. Now I looped south to Skelde and Broager Strand to see a bit more of the countryside, then headed back north to get back onto the main road. From there, follow the signs to Dybbøl, site of a battleground from the Danish-Prussian war. The Danes had built some hilltop fortifications there to protect Sønderborg, just to the east. The forts held out for a while, but eventually they were no match for the Prussian juggernaut. This is the highest spot on today's ride, with a variety of stuff to stop and see there, including a really big windmill. Now you just ride downhill to cross the bridge over to Sønderborg on the island of Als. Sønderborg is a scenic town, with lots of waterfront, a lively old-town, and a big waterside castle. After a shower at the hostel, the first thing I wanted was to get a good dinner and a beer while watching a World Cup game, and I found everything I needed at the Fox and Hounds Scottish Pub in the old-town.